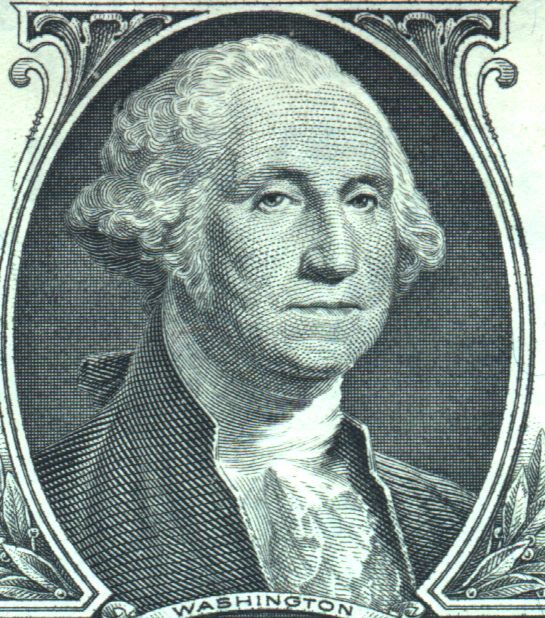 Thanks to the US $1, George Washington has one of the most recognizable faces in America. This President’s Day, I got to thinking about that portrait and two excellent exhibits I saw a few years ago at Mount Vernon and the National Gallery about the real likeness of George Washington. The dollar and a large number of contemporary and future Washington paintings are based on an unfinished portrait done by Gilbert Stuart in 1796. At the time of the sitting, George was 64 and retired to Mount Vernon. His teeth had been a constant source of pain since the first one was extracted when he was 22. When he started his presidency, only one real tooth remained in his head. Several sets of dentures were made for Washington over his life by incorporating human teeth and carved bone or tusk teeth into a metal cage. None these were reported to have fit well and must have caused him considerable discomfort. On the day Washington sat for Gilbert Stuart, he was struggling with a set of false teeth. Stuart notes, “When I painted him, he had just had a set of false teeth inserted, which accounts for the constrained expression so noticeable about the mouth and lower part of the face.” Look back at Stuart’s portrait. Washington’s jaw does appears to be clenched, pushed somewhat forward and bulky. This immediately recognizable portrait is likely not the most realistic. Eleven years before the Stuart portrait, sculptor Jean-Antoine Houdon met with Washington a made a life mask – a process in which plaster is applied to a face for an accurate sculptural model. This likeness seems less tense and the jaw line less protruded. This life mask and the bust Houdon made from it were used by Mount Vernon to create “the real George Washington”. 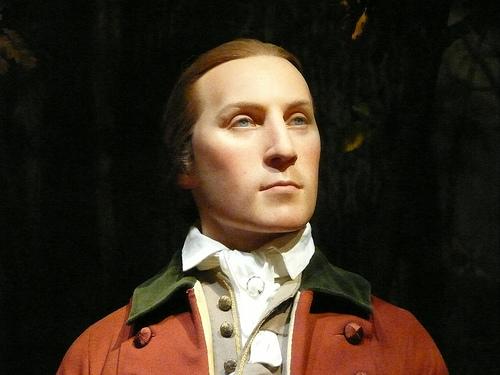 Through an interesting forensic anthropology project, the sculptures an other artifacts were scanned, analyzed and used to construct three wax faces meant to represent George Washington at 19, 45 and 57 year of age. Life-sized figures were created by examining existing clothing and written descriptions of the Washington’s posture. (You can watch a short video about the process done by the History Channel here.) The end result is incredibly impressive. The three Washington figures were one my favorite parts of visiting Mount Vernon as they help piece together a more life-like representation an American legends. i once read that washington favored artists who made his jaw more square, making him appear to be a stronger leader…very interesting thanks! It was definitely common at the time to alter features so as to reflect the subject’s character traits. I think this is why the life mask is so important in understanding what Washington really looked like. He’s one of the few American figures whose iconography is so mythological and exaggerated that it is refreshing to have a physical resemblance. As the author of The Many Faces of George Washington: Remaking a Presidential Icon, I appreciate your posting my book cover here. The team of experts that did the forensic study of Washington, and the artists and craftsmen that brought this information to life were amazing. It was a treat for me to write this book. I will be appearing on C-SPAN 2 BookTV soon to do a presentation about the book. I’ll do a presentation on March 5, and it will be shown on the network the next week-then be archived on their website in the future. Hi Carla, thanks for your comment and for visiting. I look forward to your CSPAN 2 presentation; I find this such an interesting project! That dentures are awful! Haha But back in their time I’m sure that was really fine. I once saw Mr. Washington’s false teeth in a dentist website but don’t remember that it matches your picture. I wonder if what is the genuine one.